Hi everyone! I hope you had a wonderful weekend. After a week of intense midterm cramming, I spent most of mine sleeping and reading (for fun). Of course, I also swatched my first Enchanted Polishes that I had the fortune of finally getting during the recent Harlow & Co and Nail Polish Canada restocks. I tried many online restocks before but was always too slow, finally, perseverance and fast fingers paid off! Just a warning, this post is not only picture heavy but also word heavy since the colors take on so many facets. So, I will just state that all three polishes have stellar formula – two coats to full opacity (except Djinn since it’s a holo top coat, one coat was enough) and finishing with a gorgeous shine even without topcoat. The wear test was also fantastic. Due to exam demands, I wore each polish for three days (remember, without top coat) and only had minor tip wear. Let’s start with Kids from the Time to Pretend collection. The next two images are also of Kids. Only the lighting set up was adjusted to reveal the different hues. I also color corrected my skin in order to provide you with the least distracting experience while viewing the images. Since this was my first experience with photographing such a complex multichrome lacquer, it took me a long time to figure out the right lighting. Please also bear with me as I struggle to describe the myriad of colors that are easily distinguished by my eyes but seem elusive to my words. Regardless, you will be able to see all of these colors if you applied this polish on your own nails, in real life. Just remember that the visible hues depend largely on the lighting of the environment, so, some combinations are seen more frequently in most lighting, such as the one above, than others. In this more subdued but still bright lighting set up, Kids takes on shifting hues of blue violet and sky blue, with the transition color of dark navy blue in between. I saw this combination most under warmer lighting. I adore this combination as much as the first. The third combination of Kids shifts between royal purple and indigo blue with dark, near black purple transition in between. It’s visible under the most dim and indirect lighting (I basically pointed my lights in the opposite direction of my nails and only used the reflected lighting to take this photo). I was awestruck by this last color combination since it looked so different from the first two. Next is Hey Jude from the Imagine collection. 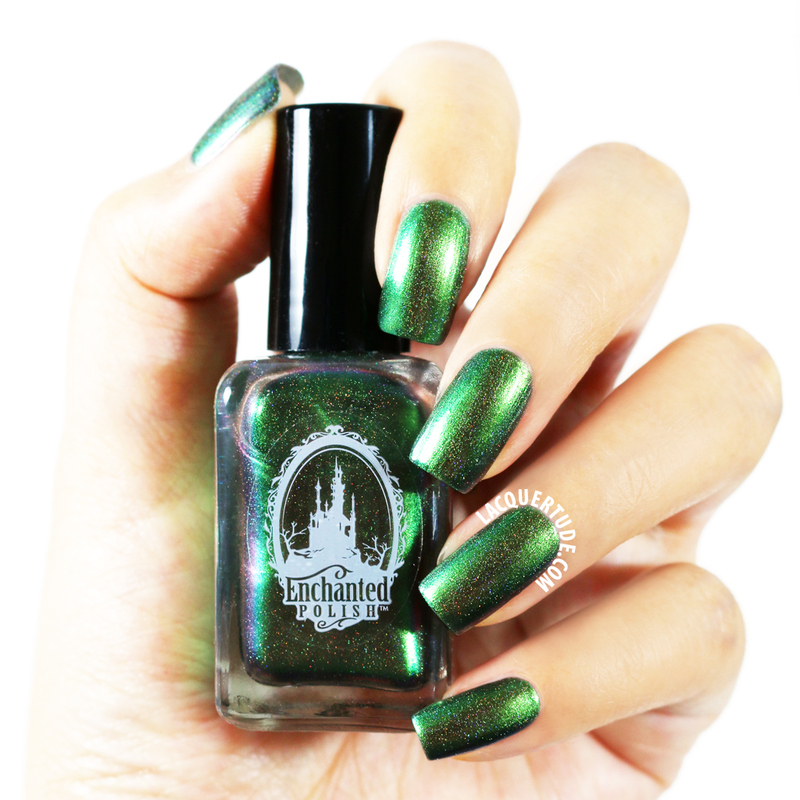 Sigh, this is such a beautiful duochrome green. I love it so much that I put it on again after my exams were over. In fact, I’m wearing it right now as I type. Hey Jude takes on a bright emerald green in bright direct lighting. Here, the holographic particles create a beautiful glow effect. Again, it looks like a gem that’s lit from within. In the dimmest and most indirect lighting, Hey Jude reveals its dark jeweled toned green the most. The holographic particles also come out to add a splash of sparkle and some rainbow effect, though not as strong as what I saw in Kids. Last but certainly not least is Djinn in a Bottle. 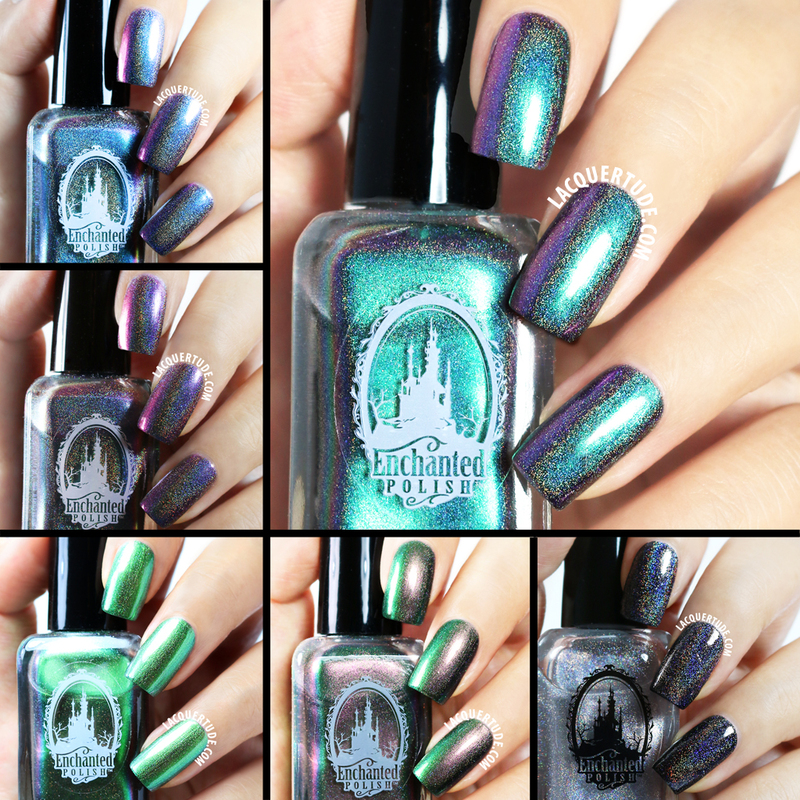 This is the holographic topcoat that I’ve wanted ever since it came out. I did tons of research and even tried a couple of other brands, but I knew I had to get Djinn. It did not disappoint. To show how well Djinn preserves the integrity of the base color, I layered it over a simple black crème (A-England Camlot). Pinky: one very thin layer. Ring: one medium layer. Middle: two thin layers. Index: two medium layers. You can see that in all combinations, the nails still all look black and the holographic effect is nothing short of radiant rainbow goodness! Experiment success! I love all of the layering combos. These nails remind me of all the stars glistening on a canvas of black sky that I saw on the top of Mount Kilimanjaro. Sigh…love, love, love! 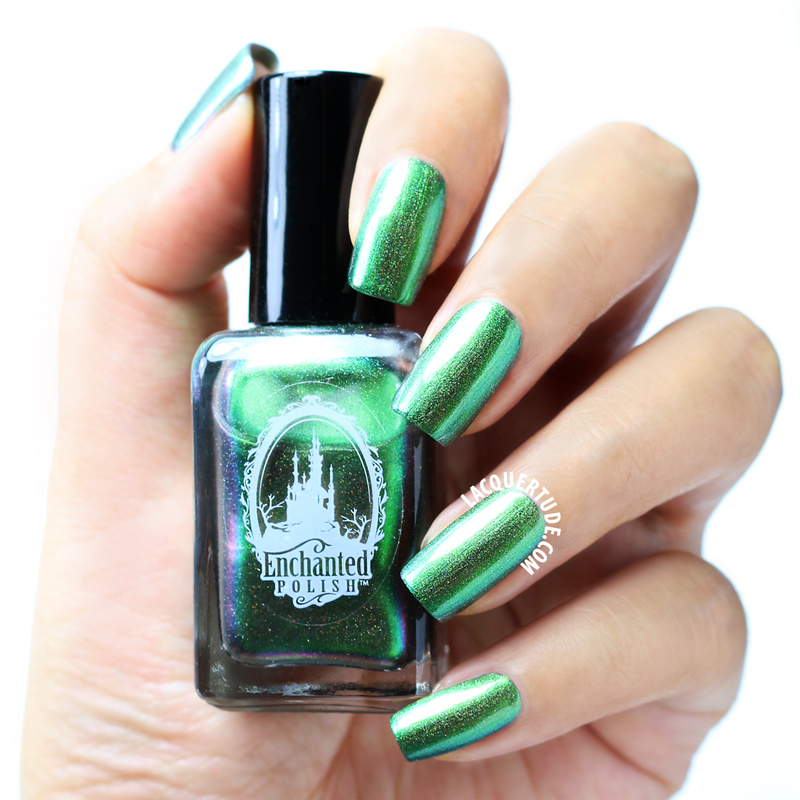 So, I hope my pictures and words did justice to these amazing creations from Enchanted Polish. Chelsea (the creator) is one amazingly talented lady. Even if my post fails to showcase the true beauty of these polishes, I encourage you to check them out yourself. If you’re as crazy as nail polishes as I am, you will be wowed. Make sure you follow the links I provided below to look out for restock information. 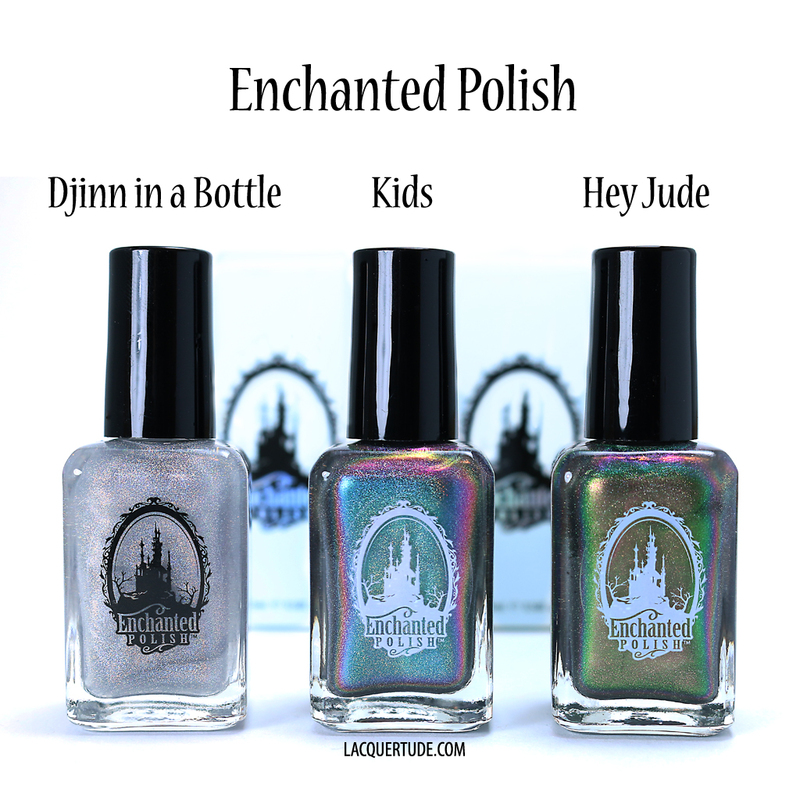 If you are already an Enchanted Polish connoisseur, then tell me, which ones are your favorites? What should I put on my wish-list next? Have a great week ahead, and thank you so much for reading!